This is a second part to my free shipping post. There are many shipping strategies one can use for their business. One such example would be a fixed amount like $7.95 regardless of order size or amount. This would however encourage large orders, but that is a good thing! As I mentioned in my other post, offer free shipping with a minimum purchase amount. There are a few benefits to offering free shipping, such as larger order sizes, item prices could increase and per-order cost may decrease. Downsides are your profit margin for the heavier items may be too low and the additional profit may not justify the increased shipping expense. 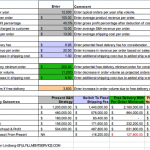 You would need run some “what-if” scenarios using each pricing method and see which one works best for your business. Click on the image to the left for a download excel sheet you may download to help you figure this out. Gotmerchant.com tailors to merchants of all types including Internet, retail and wireless credit card machines. However, this really only pertains to Internet merchants running an ecommerce store.